El Pollo Loco highlights, in its latest commercial, that the new Dinner and Dessert for Two is the perfect way to share some fire-grilled love and cinnamon sweet churros with someone special. 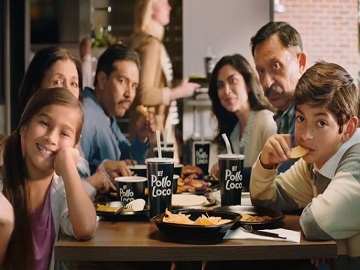 The 30-second spot features a couple of teenagers at a table, in an El Pollo Loco restaurant, looking into each other’s eyes and smiling at each other while enjoying the menu items. When he puts his hand over hers, she remembers their families are there with them, at the nearby table, watching them, and their enthusiasm soon vanishes. “Celebrate your love over a special dinner for two. Perfect for a moment of togetherness. Lots of togetherness. El Pollo Loco Dinner and Dessert for Two, four pieces of our famous pollo, an appetizer, two sides and churros. Only at El Pollo Loco,” the voiceover says at the end of the ad.